One of my favorite types of games is the arcade flight sim; games like X-Wing Vs Tie Fighter, Tom Clancy’s HAWX, and Ace Combat. While I will never get to pilot any of those machines in real life, luckily my hobby affords me the opportunity to fly around and blast things in the cockpit of my choosing without the risk of dying for real. Enter God Factory: Wingmen it is a space flight sim that….wait for it…. Is multiplayer only. This seems to be a big thing as of late, Titanfall did well without a single player campaign but can blowing up ships in space do the same thing as blowing up walking battle machines on the ground? God Factory: Wingmen is a 4 on 4 space shooter game by Nine Dot Studios, the game is very reminiscent of the popular MOBA genre of game that has hit a high as of late. The setup is this; there are two teams, both teams have a capital ship. (Think Darth Vader’s Star Destroyer, and Admiral Ackbars Rebel Corvette) These two ships fire at one another at regular intervals, and your (the players) role is to fire at the different areas of the ship to try and weaken it in hopes of destroying it. Of course in order to get to the opponents capital ship you will need to fight thru their defenses that is of course 4 fighters. The game has a very simple setup, and as I stated like some of the MOBA’s that have come out lately. Before each match you are tasked with choosing two ships to take into battle, this is where strategy is involved as you can take two bomber types and offer loads or damage. Or you can be more balanced and take a bomber and fighter and have the best of both worlds. 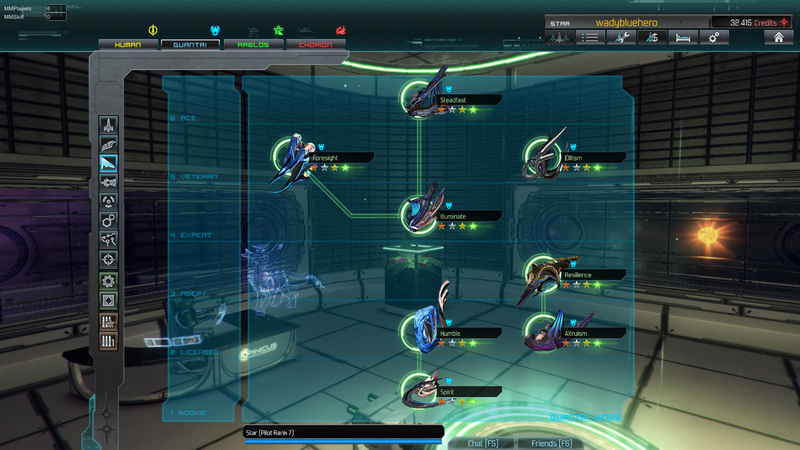 Once you choose the type of ships you will be tasked with buying weapons and upgrades for your vessel. This is where you can attach missiles, bombs, lasers, turrets and all kinds of other weaponry to your attack ship. Be sensible though, because once you fly into battle and if by chance you are blown up you will lose that ship for the rest of the fight and will be forced to fly in a less than stellar drone ship. We talked about how you will spend money, so lets take a second and discuss how you will make money. Over the course of each map you will earn money and experience for your actions in each match. The XP that you earn isn’t for your overall person as in a MMO, ro MOBA but instead for the parts or components on your ship. Use the lasers a lot and you will level them up, thrusters helping you escape tricky situations they will earn XP for that. Its this twist that adds another layer of strategy to each match, because you will need to decide if you are simply going to purchase a brand new component or upgrade your leveled up component. More often than not, I stuck with my old standbys and just upgraded them in various ways even though shiny new parts would catch my eye I am of the mindset “if it aint broke, don’t fix it” at times. While the overall graphics in the game aren’t that of Star Citizen they are extremely well done and you really feel as though you are dog fighting in space. There is flare on the engine blasts, and the lasers and explosions pop in the blackness of space as they should. The other part graphically that impressed me about this game was the designs of some of the ships. They had everything from your standard “Battlestar Galectica type fighters, to the cool (and best in my opion) Gundam type ships. 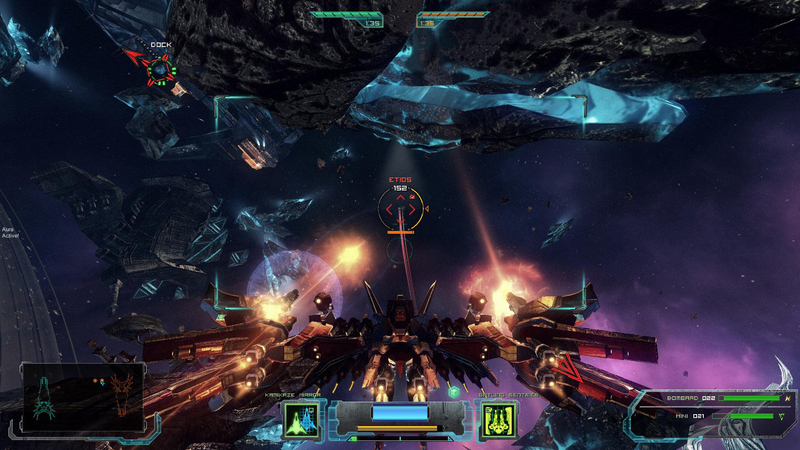 Literally it was like flying a gundam right down to the mech/ship have guns in each hand. From what I saw there is no real downside or upside to choosing one versus the other, I just think this was an extra treat that was thrown in for the player. No one wants to fly the same old boring ship over and over again. Overall I really enjoyed my time with God Factory: Wingmen, it really scratched an itch that I haven’t been able to get to in quite a while. The only negative I will point out was that the matches that I played took a bit for them to get a full house in order to start. So hopefully by reading this review you liked what you heard and will go out there and pick this one up. As I said, if you enjoy the arcade type fighting games, or the objective type multiplayer games then this is the best of both worlds that will have you in heaven.